Welcome to our 9th Annual National Week of Action Against School Pushout. Our theme this year is Counselors, Not Cops! Join us as DSC members and allies hold events across the country. COPE, 1505 W Highland Ave.
Next COPE General Meeting: October 20th, 2018 (8:30 - 10:30 a.m) @ New Hope Family Life Center. Please plan to join us! You are welcome to bring family and friends. We will not have our regular meeting at New Hope Family Life Center but will be at San Bernardino Valley College to participate in a presentation and discussion around "Civic Engagement & Higher Education." Next COPE General Meeting: January 19th, 2019 (8:30 - 10:30 a.m) @ New Hope Family Life Center. Please plan to join us! You are welcome to bring family and friends. Next COPE General Meeting: February 16th, 2019 (8:30 - 10:30 a.m) @ New Hope Family Life Center. Please plan to join us! You are welcome to bring family and friends. Next COPE General Meeting: March 16th, 2019 (8:30 - 10:30 a.m) @ New Hope Family Life Center. Please plan to join us! You are welcome to bring family and friends. 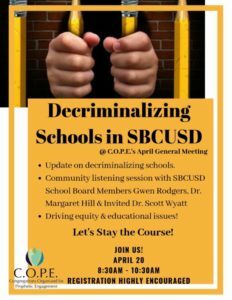 Rethink Public Safety is an initiative to promote responsible, restorative and redemptive approaches to justice reform in schools and communities throughout the Inland valley Region. Join us at the ReThink Public Safety San Bernardino County Coalition Community Engagement. Next COPE General Meeting: April 20th, 2019 (8:30 - 10:30 a.m) @ New Hope Family Life Center. Please plan to join us! You are welcome to bring family and friends.